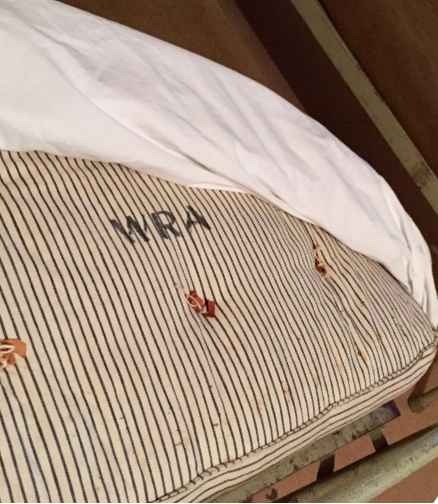 Mattress found when box from camp is unsealed after more than 70 years. 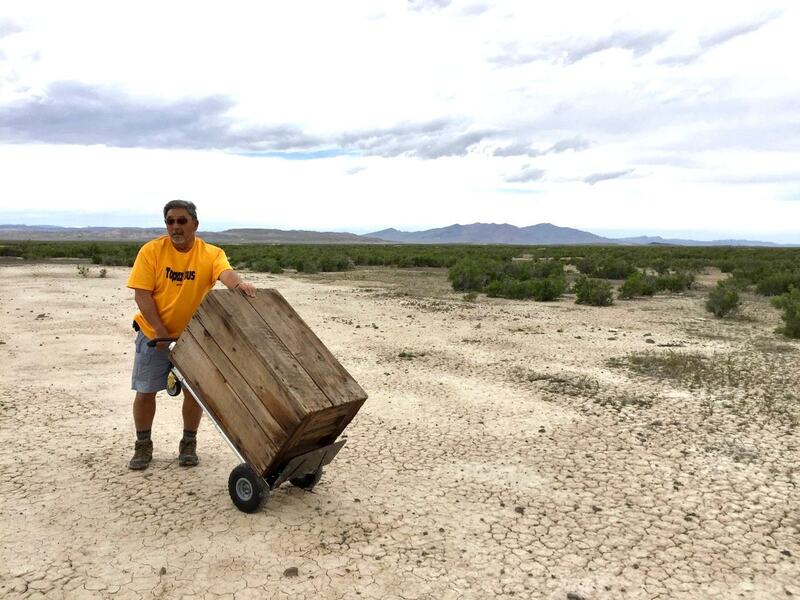 DELTA, Utah — “It’s a mattress!” exclaimed Ken Okabayashi of Elk Grove, Calif., as dusty brown paper fell away from the bulky, blue cotton bedding that emerged from its dark confines — a weathered wooden box that was packed at the Topaz concentration camp more than 70 years ago. 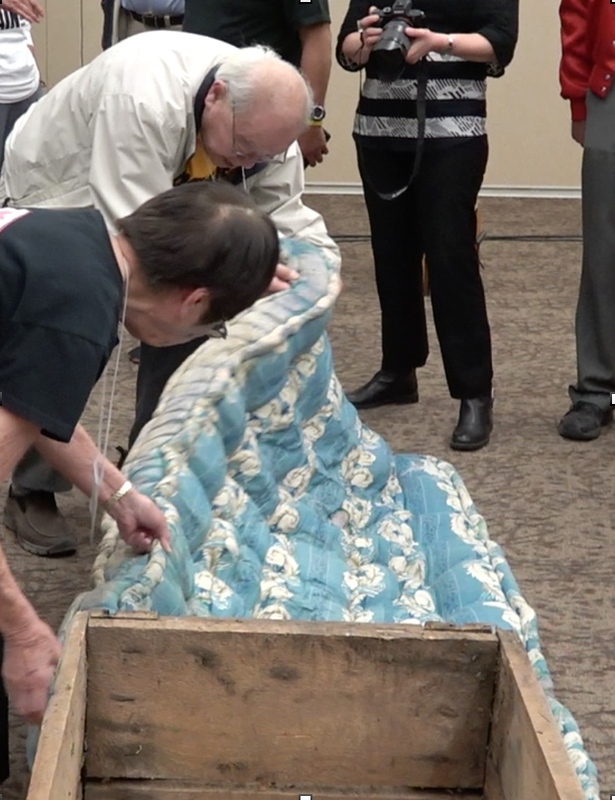 The reveal of the mattress on April 24 partly ended the mystery behind the Topaz box, an accidental time capsule. It had been given by a Topaz inmate to a fellow camp mate for safekeeping in Berkeley, but the original owner never reclaimed it. The box’s guardian then passed it on to his neighbor, Toru Saito, 79. After 18 years of storing it, Saito decided it was time to unseal the crate. The Topaz Museum will hold its grand opening, he said, and this year marks the 75th anniversary of Executive Order 9066, which authorized the mass incarceration of Japanese Americans on the West Coast. 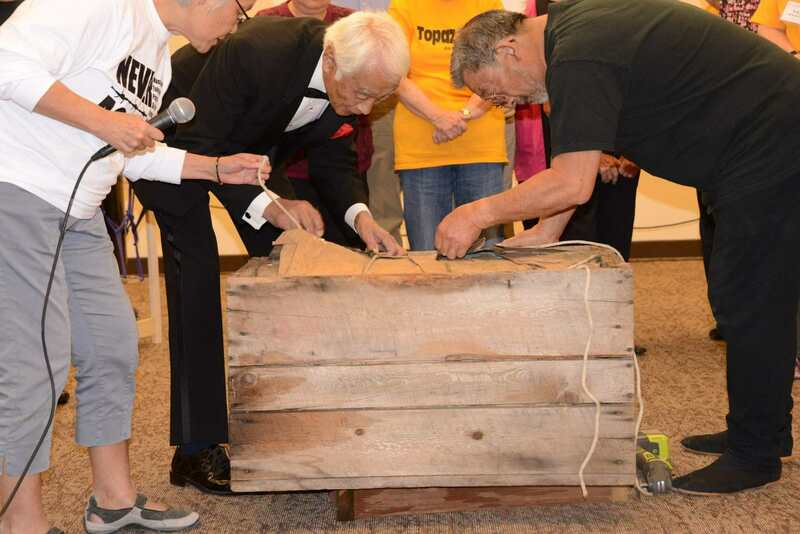 Suspense built as some 150 people in the Delta, Utah, community center, 17 miles from the original Topaz site, watched Kiyoshi Ina of Concord, dressed in jika tabi construction shoes, guide a Ryobi saw blade through the nails and lift the top planks. He was assisted by Kazuko Iwahashi of Berkeley, who was 12 years old when she was removed to Tanforan and Topaz. Also helping were Okabayashi, Saito and John Guliday of Sacramento. Ina was born at Topaz in 1942. He was among 32 camp survivors and family members who were on a five-day bus pilgrimage to Topaz from the San Francisco Bay Area, the sixth such trip led by Saito. Fifty pounds of cotton makes for a thick, nearly five-inch-deep mattress and it immediately evoked memories for Topaz survivors. Ben Takeshita of Richmond, Calif., said his first reaction was “At least it’s not a hay mattress.” He recalled arriving in April of 1942 at the Tanforan Race Track, south of San Francisco, where area citizens and immigrant residents were confined before the Utah camp was completed. Dr Satsuki Ina, a psychotherapist and activist from the Sacramento area, told the gathering that she had talked to a man who was drafted out of the camps to fight in Europe. 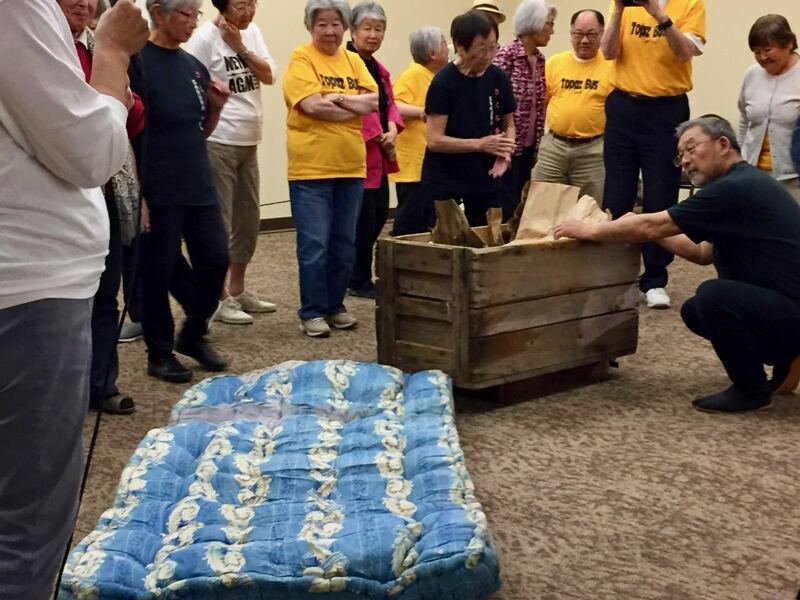 He realized that the body bags used for dead soldiers were what the Japanese American camp inmates had been given to stuff with straw for beds. 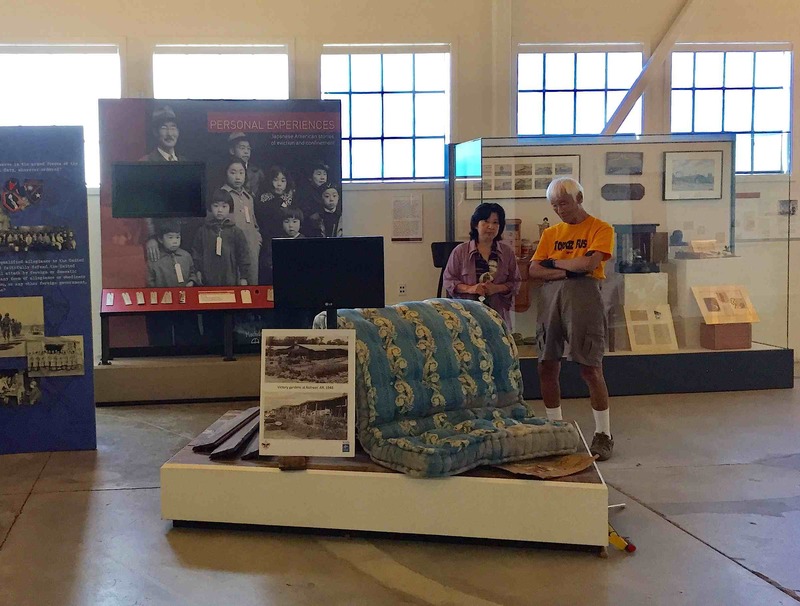 Rosalyn Tonai of the National Japanese American Historical Society and Toru Saito with the mattress at the MIS Learning Center, Building 640, Crissy Field, Presidio of San Francisco, where it will be on display until July 2.